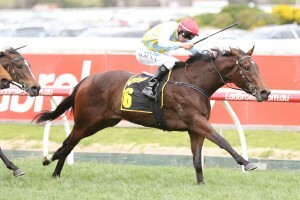 Last start winner Booker might be on the drift in the betting for the Group 1 $500,000 Schweppes Thousand Guineas (1600m) at Caulfield on Saturday but the stable is still confident of a bold performance. Booker, above, has drifted in the betting for the Thousand Guineas Prelude at Caulfield. Photo by Ultimate Racing Photos. Booker had her final lead up run for the Thousand Guineas when she won the Group 2 $200,000 Schweppes Thousand Guineas Prelude (1400m) at Caulfield on October 1, but since the final field was released on Tuesday, the Mathew Ellerton and Simon Zahra trained filly has eased from $6 to be on the third line of betting at $7. Flight Stakes winner Alizee heads the market order at $2.20 with Ladbrokes.com.au ahead of Thousand Guineas Prelude runner up Shoals at $4.20. “It’s not easy and it’s going to be a tough ask but I think we’ve got the right filly,” co-trainer Simon Zahra told AAP. The Thousand Guineas has only attracted a small field of eight fillies but Zahra acknowledges that there are several genuine chances. “Obviously Alizee was a pretty big run the other day and Shoals has done nothing wrong either,” Zahra said. The James Cummings trained Alizee deserves to be favourite on the way she toyed with her opposition last start in winning the Group 1 $500,000 Flight Stakes (1600m) at Randwick on September 30. Booker has drawn the outside barrier in the eight horse field and will be ridden again by Dwayne Dunn who is very confident that the Written Tycoon filly will handle the step up to 1600m for the first time. “Dwayne trialled her for us about two months ago and got off and said she felt like a miler,” Zahra said. “We were happy to go towards this race instead of keeping her to the sprints. Booker hasn’t been out of the prizemoney in all her five starts to date, recording two wins, two seconds and a third with prizemoney earnings of $286,000.